A tendon is the end part of a muscle that attaches the muscle to the bone. The normally very elastic and soft muscle tapers off at the end to form the much more dense and stiff tendon. While this density makes the tendons stronger, the lack of elasticity of the tendon and the constant pulling on its attachment to the bone with movement, makes it much more susceptible to a low level of tearing at a microscopic level. 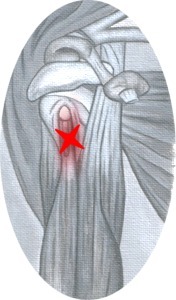 This tearing will produce the inflammation and irritation known as tendinitis. Often spelled tendonitis, either spelling is correct for this condition. Tendinitis is usually seen after excessive repetitive movement with which the tendon gradually becomes tighter until the fibers start to tear. For example, a person who plays tennis may over-use the muscles of the elbow through hitting the ball repetitively and cause tendonitis to the area. The most common tendon areas that become inflamed are the elbow, wrist, biceps, shoulder (including rotator cuff attachments), leg, knee (patellar), ankle, hip, and Achilles. Of course, tendonitis can will vary with each person, as it strikes the areas you use most. With proper care for the area, the pain in the tendon should lessen over three weeks, but it should be noted that the healing of the area continues and doesn't even peak until at least six weeks following the initial injury. This is due to scar tissue formation, which initially acts like the glue to bond the tissue back together. Scar tissue will continue to form past six weeks in some cases and as long as a year in severe cases. After 6 months this condition is considered chronic and much more difficult to treat. The initial approach to treating tendonitis is to support and protect the tendons by bracing any areas of the tendon that are being pulled on during use. It is important to loosen up the tendon, lessen the pain, and minimize any inflammation. This can be done topically if a pain reliever has the ability to penetrate the skin barrier and contains anti-inflammatory agents. A topical formula that contains natural menthol will not only relieve pain, but dilate the blood vessels. This allows for relief of the tendonitis, without causing any stiffening of the tissue. MSM, also known as Methyl Sulfonyl Methane is a natural supplement that is getting a lot of attention due to its role in tissue healing at a cellular level. It is a natural organic sulfur that comes from rain fall and is found naturally in the human body. It has been shown to have anti-inflammatory effects on the tissues. 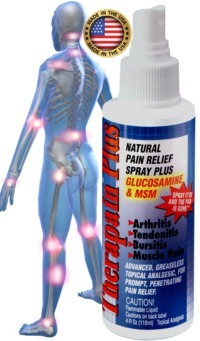 See all about Glucosamine and MSM for more information this supplement. Ice can relieve inflammation, but will constrict the blood vessels and further stiffen the tendon, so it should be used in the acute stage (first 72 hours after onset) or as a post inflammation reduction treatment after exercise. Cortisone injections can reduce inflammation, but unfortunately are very caustic and can cause a weakening of the tendon structure and a create more scar tissue. Dr. Swartzburg, our site editor, worked in conjunction with our sponsor, Relief-Mart, to develop a spray for Tendonitis called Therapain Plus. It has all natural pain relievers plus 14,000mg of MSM and Glucosamine which is clinically proven to decrease the symptoms of pain and inflammation, while increasing flexibility. After the scar tissue has begun to accumulate, it will be important to perform procedures which help break down the scar tissue in the tendon tissue, so as to let the tendon and muscle regain it's normal flexibility and lessen the chance of further injury. While exercise is appropriate for breaking down scar tissue once the area has healed, it may further irritate the area during the initial stages. Therefore, other methods that can be performed by your healthcare provider, such as ultrasound and massage, may be safely used to accomplish this early on in the injury. Ultrasound uses sound waves that vibrate a such a fast level, that it cannot be felt with normal use. Ultrasound will cause an increase in circulation to the tissue and soften the scar tissue to allow it to further break down. Ultrasound can also be used as phonophoresis to help topical pain and nutrient solutions reach further down into the tissues by transporting them with the sound waves. Light stretches may also be performed if they do not cause any further irritation to the area during the acute phase. During the sub-acute and chronic phases of Tendonitis, more aggressive stretches can be performed, however, it should be noted that stretches should focus on the muscle belly and not attempt to lengthen the affected tendon. Additionally, you should not feel any irritation in the tendon during these muscle stretches. Prevention of this condition requires stretching the muscle on a regular basis and thereby lengthening the tendon connection. This will allow less pulling and tractioning on the tendon attachment to the bone. When tendonitis does occur, it is important to treat it immediately, and thereby prevent it from reaching a stage that is more severe. That may require that you stop whatever exercise or lifestyle activity that brought on the onset of the condition temporarily, however, with proper treatment and prevention techniques, tendonitis is fully manageable and can can heal properly without any further complications.